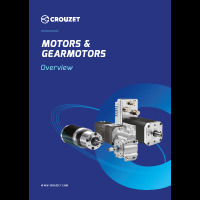 Description: For 50 years, Crouzet has been an expert in fractional horsepower motors, developing complete, customized, motorization solutions, including motors, DC geared motors, brush and brushless motors and geared motors, electronic control boards, synchronous motors, stepper motors and linear motors. Crouzet’ vast ranges of brush and brushless DC motors are designed to operate in the most demanding environments and in mission-critical applications. Description: Simple two-wire networking of up to 127 motors over distances as great as 5 km is now possible in Crouzet’ SMi21 range of DCmind Brushless Motors and Gearmotors, featuring a growing library of easy-to-use application specific software. Description: The quietest Brush DC motors on the market: exceptional efficiency and working life. With over 50 years of expertise in innovative motorization solutions, Crouzet launches DCmind Brush DC Motors, a new range of high-performance direct current brush motors. 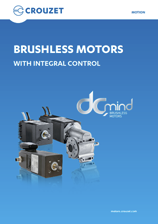 Developed at Crouzet’s Global Center of Motor Technology in France, the new DCmind Brush DC Motors are the quietest on the market, making them ideal for use in medical equipment, pumps and valves, railways, and aeronautics. Description: Crouzet has been involved in the railway industry in Europe for more than 30 years. As a specialist in motors and geared motors, brush or brushless, our offer covers a wide range of power and torque ratings, ideal for the development of on-board electrical applications. 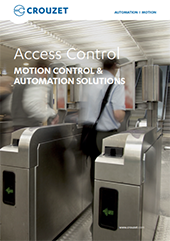 Constant innovation and a strong capacity for adapting products to customers’ requirements help ensure compliance with rail industry standards..
risus. in facilisis tristique Nullam vel, id mattis consequat. elit.